DALLAS, TX – Heritage Auction Galleries announced today that it will be adding a third session to its weekly Internet Coin Auctions. The new session will take place on Thursday nights, starting April 2. Collectors are already lauding Heritage for adding another opportunity for erudite numismatists to obtain the coins they might have missed in a previous session, or might have developed a sudden need for. Each session will be open for one week and close at 10 PM, with a new session opening up immediately. "We’re happy to be able to give collectors this chance," said Greg Rohan, President of Heritage Auction Galleries. "The benefits of the third session go well beyond just being able to expand your collection. It gives collectors a chance to bundle purchases from the Sunday and Tuesday Weekly sessions to save on shipping costs, and to potentially save on sales tax in the State of Texas." Heritage’s Weekly Internet Coin Auctions have long been a staple for serious coin collectors, giving them weekly opportunities to hone the body of their collections. The third session, with the bonus of grouping purchases from the previous two, represents an extra sales tax saving to collectors spending more than a total of $1000. "For those collectors that spend a good amount of time and money in these auctions, the savings can be substantial," said Rohan. "We’ve added this session due to the demand for it among collectors seeking to expand their collections and to save a little bit on the back end." Shipping purchases from all three sessions is also a significant saving on shipping costs. Early check-out will also still be available after each individual session so collectors can have their coins shipped as soon as possible. 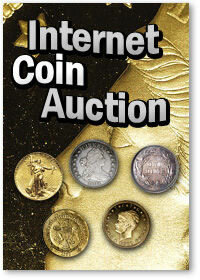 The first Thursday session of the Heritage Weekly Internet Coin Auctions is scheduled for April 2, 2009. To reserve your copy of any Heritage auction catalog, please contact Client Services at 1-800-872-6467, ext. 150, or visit www.HA.com to order by email.